There is no factual basis of the Congress’s allegation that the Narendra Modi government favoured any company, Anil Ambani’s or anybody else’s, in choosing an offset partner for Dassault Aviation, the maker of Rafale fighter aircraft. But Rahul Gandhi is going on and on at the expense of the country’s defence preparedness. New Delhi: The lies propagated by the Congress once again stand exposed and this time by the country’s apex court. The conclusive dismissal of all PILs filed on the Rafale contract has not just vindicated the government’s stance but has also ensured that the victory belonged to the country and its citizens. In a democracy, it is normal for the opposition to question the decisions of the government. But in the case of allegations made against the government on the Rafale deal, the Congress undermined all democratic principles and jeopardised the national security. By making charges based on complete falsification of ground realities, the Congress has redefined democracy in more ways than one. The three-judge bench headed by Chief Justice Ranjan Gogoi observed in its judgment that there was no occasion to doubt the process of the deal and that the court was satisfied with the decision-making process. The BJP government has time and again vouched for the deal’s transparency and has held that the decision to buy 36 Rafale fighters in a flyway condition was based purely on the critical requirements of the Indian Air Force. Here, it will do well for the Congress to revisit their 10-year rule with one man at the helm of the defence ministry throughout the period. The inability and inaction of the then Defence Minister AK Anthony took the country’s defence preparedness back by several years. It was in 2007 that the Indian Air Force first put forth the demand for Medium Multi Role Combat Aircraft (MMRAC). The UPA government invited tenders for the same and Dassault Aviation, the French jet-maker that bade the lowest, was chosen. With time, the Congress seems to have forgotten that the UPA government kept on negotiating the deal with Dassault for 126 fighter jets but no consensus could be reached between both the parties regarding the price or the modalities. 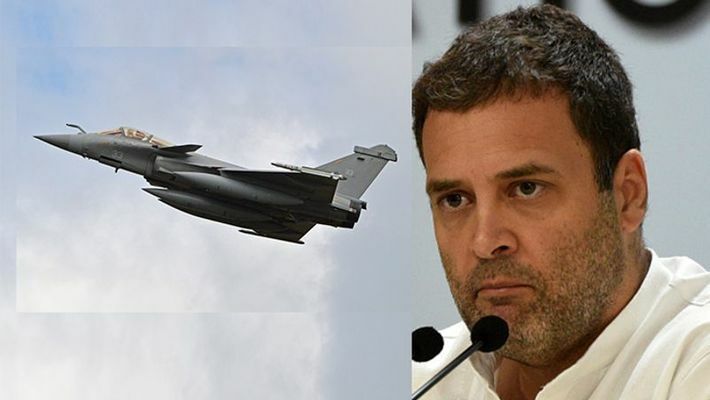 The tall claims made by the Congress that they had reached an agreement where the price of each jet was pegged at a certain amount is nothing but a story weaved by a party that seems to never run out of its concoctions. What the Congress tried to do by raking up a controversy over the Rafale deal was to hide their years and years of inaction and give a sense to the people that for them country comes first. With the 2019 elections fast approaching, their desperation to wean the attention of the nation from the most pressing issues is understandable. It took the Prime Minister Narendra Modi-led BJP government a little over four years to correct the historic wrongs of the Congress rule. In addition to the Rafale deal securing the country, it also increased India’s stature in the world. It is conveniently ignored by many that the Rafale deal remains one of the biggest foreign policy achievements of the BJP government. With the successful completion of the deal, India was seen as a country that was becoming an exponent in quick decision making and where there was ease of doing business. There was finally a government led by a Prime Minister that was giving utmost importance to national security and national interests. Unfortunately, these are not the terms that the Congress will ever understand. In the years that they have ruled the nation, personal interests, personal benefits and personal glory have dominated their discourse. The multiple scams that the members of the Congress government have got themselves embroiled in do not require any special mention. Perhaps, it is this very perspective that they have of looking at things that drove them to make wild allegations of commercial favouritism against the government without any evidence. The transparency that the BJP government has brought in the system by making information accessible to each and every citizen is unparalleled. For a process where power is vested completely with Dassault to choose its commercial partner, the Congress falsely accused the government of playing a role in choosing an offset collaborator. The interview of former French President François Hollande was cleverly misconstrued to mean that the government had a role in the choice of a partner. Whereas, all he said in the interview was that the French government did not make any decision in that regard. The truth is that it was a deal between two commercial entities where both the respective governments had no role to play. The Rs 59,000 crore Rafale deal signed by the BJP government had no foul play in it is established beyond any reasonable doubt now. If anything, the deal was done with the intention of adequately arming India’s forces and readying them for exigencies. In addition to that, the deal gave a major fillip to the Make-in-India initiative. By insisting that components of the 36 Rafale fighter jets should be manufactured in India, the BJP government had given a significant boost to indigenous defence manufacturing, something that seemed a far-fetched dream as recently as four-and-a-half years ago. For years, India has been dependent on other countries for its defence imports with access to technology remaining the single biggest barrier. If it were any other opposition party, they would know well not to resort to fallacies. The country has seen the apathy of the Congress in strengthening the armed forces and securing the borders. It might be difficult for them to accept that the myths that they spread of defence procurement and indigenous manufacturing being difficult processes are finally unravelling under a government in a short span of time. However, it was the foremost responsibility of other elected representatives who raised questions on the Rafale deal being to safeguard the interests of the country. In an age where India has enemies both within and outside its borders, it was necessary for the country to showcase a united front before the world. Arguments make a democracy healthy but spreading of blatant lies in the hopes strengthening a party’s vote-bank is the lowest of low that a party can stoop to. Unfortunately, the Congress has done exactly that. It was a despicable attempt by the Congress and its president Rahul Gandhi that can imperil the very future of the country. Now it is for the nation to decide whether it wants to believe in the plethora of lies being spread by the Congress or appreciate the leaders who are working tirelessly to protect the interests of the people.